I have spent my whole life working with animals, as my uncle was a farmer and I grew up with no other destiny as my love for animals was so strong. Its funny, I never realised how much thought needs to be put into flooring until I became a veterinary nurse. This issue has only become more highlighted as I became an animal physiotherapist. Flooring was always been second nature for me. Even on farms, we paid a lot of attention to the floor and bedding to ensure it was good for the animals foot care. It had to be shock absorbing, non-slip and not allow the animals to get wet hooves, paws or claws. It doesn’t matter what animal it is, we need to think about the same basic principles. When I became a nurse I did some home visits and became more aware that many people lived differently and had different types of home and décor. When I became an animal physiotherapist I became more aware than ever before, that there were other type of flooring out there were less than ideal. Some of the questions I have to raise with owners is, what type of flooring do you have? A common answer was laminate or tiles. As time has moved forward more and more people are opting for hard floors for the understandable convenience and cleanliness. Lots of the flooring has become more varied aesthetically, but many hard options remain shiny and hard and cold. We are all very house proud these days and with it becoming more expensive to move house and buy homes, people are choosing to invest in making their own home perfect. This is wonderful! I would like to ask that in choosing perfection, please remember to think about the comfort of our animals in those homes too. It’s actually not even just for the animals. As we age, we will also see great benefit in choosing a floor that suits these needs too. An ideal floor will have good grip. If we lose our balance we need to be able to rely on our feet and not slip more. Rather like tyres on the road. A little forgiving slide is OK as it allows you to slow to a stop without damage, but skidding is a real worry, especially for the older pet or human. 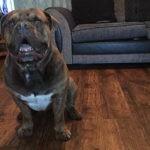 Laminate and high gloss floor tiles don’t allow enough grip and so can make our pets feel unsafe. Some dogs even get to the point where they refuse to walk on these types of floor, and I have seen this countless times. In many cases the dog may alter their gait and walk looking very strange as they over use too many muscles to try to be extra careful on the floor High gloss and laminate also make it virtually impossible for some animals to get up from laying on as they can’t get the traction needed. An ideal floor is an easy to clean one! I understand this completely, so it can be easier to have a hard floor rather than carpet. Vinyl makes a great compromise as it is easy to clean and has excellent grip. After all, we can’t carpet every room, its just not hygienic or practical. An ideal floor is not too hard or cold. That might sound ironic when talking about hard floors, but if you fall on a tile or stone floor it is less forgiving than a fall on a less solid surface. The temperature is also something to consider. The circulation in paws and feet is poor compared to the rest of the body, so they get cold so walking on a cold surface is not kind, especially for arthritic toes. Many of our pets will also choose to lay in the room we are in and if they are laying on a very cold stone or tile surface then their muscles can become very stiff. They can also get sores on their bony prominences, like their elbows, from where the circulation is so poor as they have laid with the pressure on the skin for too long on a hard surface. I too, like many others, am going through a home renovation. 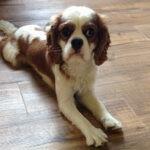 I was over the moon when I found Floors for Paws on my hunt for suitable flooring. I am a big fan of vinyl for the grip, temperature, and ease of cleaning. A big feature of Floors For Paws is the extra scratch resistant layer, and I definitely think this is a big bonus to stop claw marks. I have an old arthritic dog and a young 3 legged dog. Both love to follow me into my kitchen and my bathroom! Both will benefit, and most importantly, over my life I will have many dogs and they will all benefit regardless of age. I also know my whole family and myself, will also benefit. Thank you Floors for Paws! Donna Wills PGC A Phys, RVN, MIAAT.